For the ship of the same name that sank in Lake Michigan, see Christina Nilsson (shipwreck). 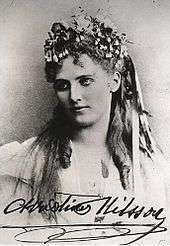 Christina Nilsson, Countess de Casa Miranda, (20 August 1843 – 20 November 1921) was a Swedish operatic soprano. She possessed a brilliant bel canto technique and was considered a rival to the Victorian era's most famous diva, Adelina Patti. Nilsson became a member of the Royal Swedish Academy of Music in 1869. Christina Nilsson was born Kristina Jonasdotter on Sjöabol farm, near Växjö, Småland, to the peasants Jonas Nilsson and Cajsa-Stina Månsdotter. From her earliest years, she demonstrated vocal talent. She taught herself to play on the violin and flute, and sang in the peasants' fairs in Sweden with her brother. She was discovered by a prominent civil servant when, aged 14, she was performing at a market in Ljungby. He soon became her patron, enabling her to have vocal training. She was a pupil of Franz Berwald for two years. Pandora by Alexandre Cabanel, 1873. Nilsson was the model for this painting. In 1860, she gave concerts in Stockholm and Uppsala. After four years' study in Paris, she had her operatic début 1864 as Violetta in Giuseppe Verdi's opera La Traviata at the Théâtre Lyrique, Paris. After this success she sang at major opera houses in London, Saint Petersburg, Vienna and New York City. She also appeared in the Metropolitan Opera's inaugural performance on 22 October 1883 in Gounod's Faust. 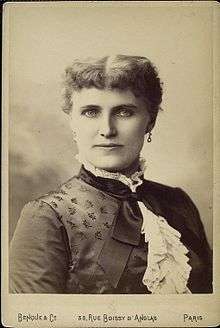 In September 1885 she was contemplating retiring from the spotlight, and held a farewell concert from the balcony of Grand Hotel in Stockholm. An estimated 50 000 people gathered to hear the world famous soprano. Suddenly a rumour spread that the scaffolding on a nearby building was falling down, and panic spread in the crowd. 19 people were killed in the chaos that followed, and the dead bodies and all the injured were brought to the hotel lobby, where a horrified Nilsson met them. The Stockholm police were criticized for the way they handled the event, and Nilsson never got over the accident. She donated generously to the families of the victims. Christina Nilsson was married in Westminster Abbey to the French banker Auguste Rouzaud, who later died in 1882. In 1887 she married Angel Ramon Maria Vallejo y Miranda, Count de Casa Miranda, who died in 1902. In correspondence, Nilsson often signed her first name as Christine, and during the last part of her life she was generally known as the Countess de Casa Miranda. She died in Vaxjö, Sweden in 1921. Unfortunately, unlike Patti, she never made gramophone recordings of her voice. 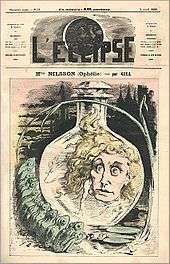 Nilsson as Ophelia, caricatured by André Gill, 1868. There are many similarities between Nilsson and the character of Christine Daaé in Gaston Leroux's novel Phantom of the Opera, and many believe Leroux based the character on the real-life opera singer, although evidence for this is unverified. The Dutch artist Anton Pieck (1895-1987) has an illustration of a street corner scene, in which a sandwich man advertises a performance of Donizetti's Lucia di Lammermoor at the Opera by Christine Nilsson. At the corner, by the sign of the Old Queen's Head Inn, stands a man selling jack-in-the-boxes. At the center of the scene, which presumably takes place in England perhaps London, circa 1890, we see a man pedaling a penny-farthing. Edith Wharton's novel The Age of Innocence (1920) opens with a description of a performance of Gounod's Faust at the Academy of Music in New York City in the early 1870s, with Nilsson performing the role of Marguerite. It is possible that Wharton actually attended performances at the Metropolitan Opera in the 1880s (she was still a child in the early 1870s). Nilsson is also mentioned in later portions of the novel. Nilsson is mentioned briefly in Leo Tolstoy's novel Anna Karenina. Sarah Elizabeth Forbush Downs's novel Max:A Cradle Mystery (1890) refers to visiting Nilsson performances in Chicago. 1 2 3 Emens, Helen Byington (1896). "Women as Vocalists". In King, William C. The World's Progress as Wrought by Men and Women in Art, Literature, Education, Philanthropy, Reform, Inventions, Business and Professional Life. Springfield, Massachusetts: King-Riehardson Publishing Co. pp. 476–478. Retrieved 4 May 2015. Die Goede Oude Tyd, by Anton Pieck and Leonhard Huizinga, Zuid-Hollandsche Uitgeversmaatschappy, Amsterdam, 1980, page 31. De Werelde van Anton Pieck, text by Hans Vogelesang, La Riviere & Voorhoeve, Kampen, 1987, page 197. Wilson, James Grant; Fiske, John, eds. (1900). "Nilsson, Christine". Appletons' Cyclopædia of American Biography. New York: D. Appleton.